We at Operation Jericho Project strongly encourage those with children still in public schools to review the textbooks used at your child’s school as well as the additional curriculum materials used in their lessons. The information contained on this page is just a small sampling of how the Islamic influence has become a part of our nation’s public school education system. The amount of Islamic instruction will vary in the school districts. This is one of the many reasons that we at Operation Jericho Project recommend removing children from public schools. All across the United States, the Common Core State Standards have been implemented, and guess who is behind this push: None other than the Muslim Brotherhood’s number one front organization… The Islamic Society of North America (ISNA). This brochure will give a brief overview of how today’s Social Studies textbooks “omit essential data and provide indoctrinating narratives that devalue Israel, Judaism and Christianity in favor of Islam.” Download this brochure here. FIVE PILLARS OF ISLAM is taught to our nation’s children but parents won’t find THE TEN COMMANDMENTS in the same textbook. To accomplish this, today many Social Studies textbooks omit essential data and provide indoctrinating narratives that devalue Israel, Judaism and Christianity in favor of Islam. Typical is Prentiss Hall’s “World History,” which devotes a 72-page chapter to Islam and only small paragraphs about Judaism and Christianity which are embedded in other chapters. The authors neglect any further explanations of this statement leading to a negative conclusion about Christianity. For far too long now, educators have gotten away with presenting a sanitized version of Islam in our public schools. Some times this is done intentionally by instructors who toe the politically correct line so prevalent these days and wish to say nothing that might in some way “offend” someone else, even if it is the truth. At other times, educators have no choice in the matter, as they are required to teach from accepted and approved curriculum. Additionally, textbook publishers portray a very rosy version of Islam in mainstream publications, while at the same time denigrating other world religions to cast them in a much less favorable light compared to the view Islam receives. The teaching of Islam in our public schools is not only in the textbooks, but online as well. 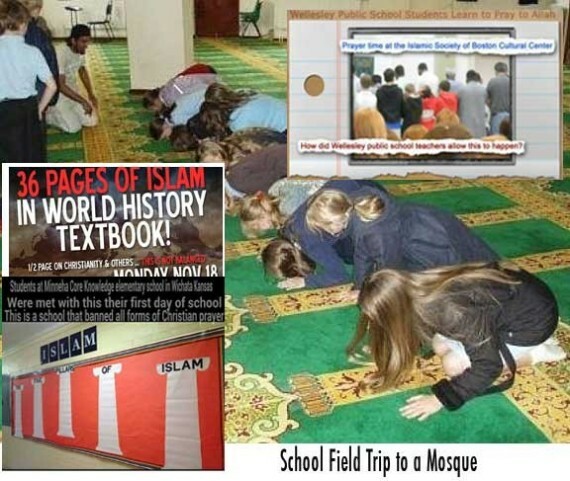 In 2011 a Muslim Brotherhood-linked organization, The Qatar Foundation International, or QFI, partnered with the U.S. Department of Education and the State Department to facilitate an online program aiming to connect all U.S. schools with classrooms abroad by 2016. This is known as the “Connect All Schools” project and hundreds of U.S. schools are already participating. Connect All Schools is about connecting our children to the culture of other nations with Online learning. QFI, funded by the Qatari government, the initiative was founded in response to Obama’s call in his June 2009 speech to the Arab world in Cairo, Egypt, to “create a new online network, so a young person in Kansas can communicate instantly with a young person in Cairo.” more…. Families who believed they were fleeing the horrid education of public schools by choosing the “conservative school choice option” of charter schools, are now learning that their school is operated by Fethullah Gulen who is the most powerful religious leader in Turkey today, even though he lives in Pennsylvania. For more than twenty years, I have been working to expose anti-Christian bias within America’s popular curriculum. But it wasn’t until I ran across a copy of Curriculum Standards for Social Studies (NCSS),1 published by the National Council for the Social Studies under a US Department of Education grant, that I realized the force of law was now driving an agenda to undermine Christian principles. Can it be any clearer? Rather than teach America’s history and preserve her founding principles, the new mission of social studies is to prepare our children to adapt – to the transformation of America. In fact, the NCSS are missionaries of a new religion operating in the field of American education. These particular missionaries have government backing, free reign with captive children, and operate under the radar of most Christians – who place their children in government schools. America’s founding ideas are rooted in the Judeo/Christian worldview. Even the few Founders who might not have been doctrinal Christian regarded these principles as the best source for moral self-government, liberty, justice, and establishing the proper function of government. Facts that get in the way of an agenda are censored or distorted. Undermining our Founders is necessary in order to bulldoze the Founding Christian principles – the true source of liberty. 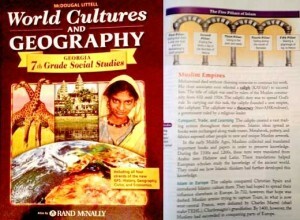 A few textbooks have begun (in the name of Multicultural Diversity) to include lessons on various religions. Unfortunately Christianity is undermined while every other religion is presented in a positive light. For example, the textbook My World – Adventures In Time and Place demotes Jesus to a “teacher who learned the Jewish religion and then started his own religion.” In six pages that pertain to Christianity, there is not one mention that Christians believe Jesus was the Son of God, came to die in our place, nor that He is said to have fulfilled Jewish prophecy.